7 Heavenly Luxury Beach Front Villas. Beautiful Villas with Private Beaches and Beach Access. There is no better way to escape from the arduous tasks of daily life than heading to some of the best beach spots across the globe. With bright blue seas, views right to the horizon, and beautiful sandy beaches it is understandable why a beachfront villa would be the ultimate heavenly holiday destination. We offer many luxury beach villas and in this blog I am providing some of the best villas with beaches for your next summer vacation. 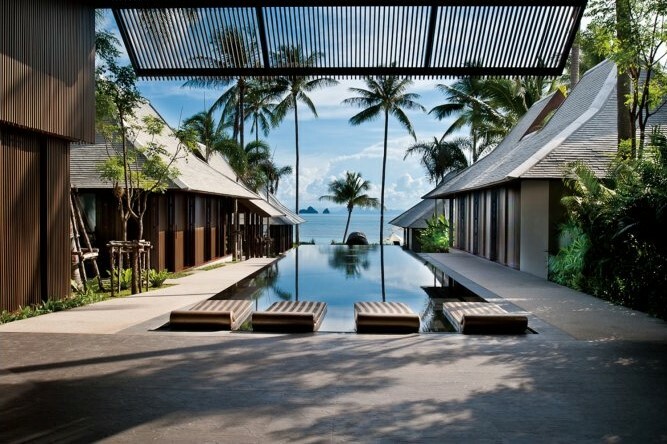 The luxurious beach front Villa Akatsuki offers amazing views of Koh Samui’s west coast. Tucked away in a lush tropical garden this villa in Koh Samui is the perfect tranquil retreat. The villa is just steps from the Lipa Noi beach, famous for its fine white sand beaches and stunning views of the Gulf of Thailand. With the villa’s master suite, Umi, you even have your very own private beach. The villa offers five unique suites sleeping up to 15 guests and has a gorgeous infinity pool, spa room, theatre room and of course the amazing beach, great for families and friends alike! Villa Water’s Edge is an impressive luxury water front villa on the shores of the Côte d’Azur. The villas is located in Saint Tropez’s prestigious private domain of Les Parcs. This stunning waterfront property provides great terraces, breathtaking views and of course direct access down to the water’s edge. The luxury beach villa in St Tropez is very spacious and superbly finished and can sleep up to 10 guests. It has a beautiful sweeping infinity pool and really takes advantage of its amazing viewpoint. Are you looking for a luxury villa with a private beach? Well look no further, Villa Faros has two! This beautiful beach villa is located just outside the small fishing village of Sigri on the west coast of Lesbos. Built on the foreland of “Faros” Lighthouse this luxury Greek villa sits right on the peninsula with boundless deep blue sea surroundings. You really couldn’t get any closer to the sea unless you were sleeping in a canoe. Villa Faros can sleep up to 16 guests and provides a secluded and tranquil getaway for anyone looking for somewhere for some blissful downtime. The villa even comes with its own personal Sea Ray boat which is available at a supplement…..perfect for family entertainment. You are sure to be on cloud nine when staying in the luxurious Villa Svilla. 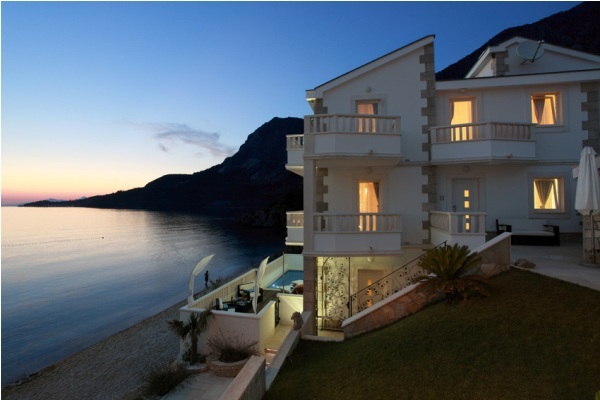 The villa is located on a gorgeous beach in Drašnice on the Makarska Riviera. The beach holiday house has an elegant and homely feel to it and comes with a truly remarkable view. With a spectacular view dominated by the seas on one side and steep cliffs of the Biokovo mountian on the other, you are sure to be happy as a clam staying here. The villa can cater for up to 10 guests and includes a private pool, large terraces, use of a 5m boat and of course that all important beach access. 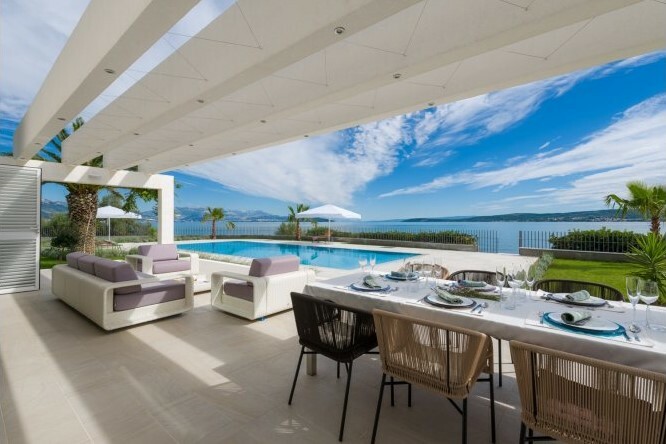 Villas on the Dalmatian coast don’t get much more perfect. The Grand Presidential Spa villa stands majestically on its own private paradise on the Greek island of Zakynthos. This luxury beach villa with private beach has amazing views and would be a fantastic destination for your summer holiday to Zakynthos. 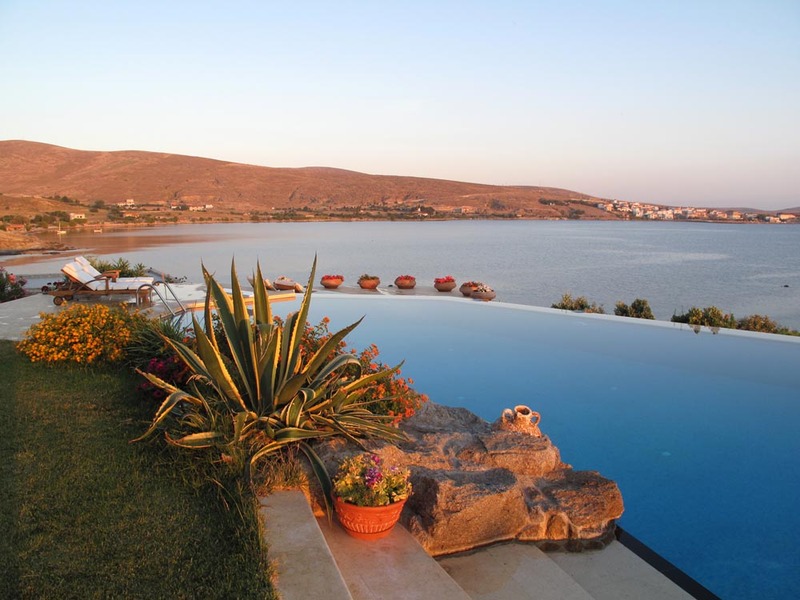 It has a large infinity pool which has panoramic views of the Ionian Sea, nearby island of Kefallonia and Kyllini Castle. The villa has a beautiful tropic garden and a private path leading down to the water’s edge. The Grand Presidential Spa Villa can sleep up to 7 guests and features an infinity pool private garden and beach and a spa. 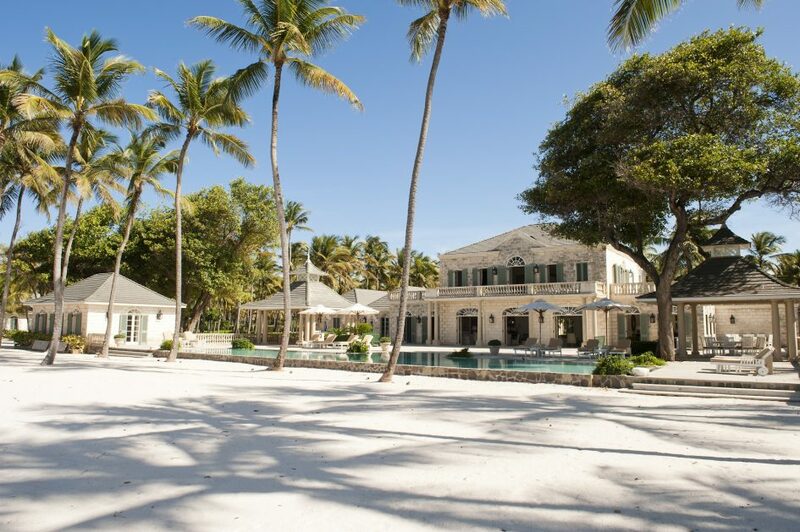 Villa Palm Beach, as the name suggests, is located on a beautiful beach, surrounded by swaying palm trees. 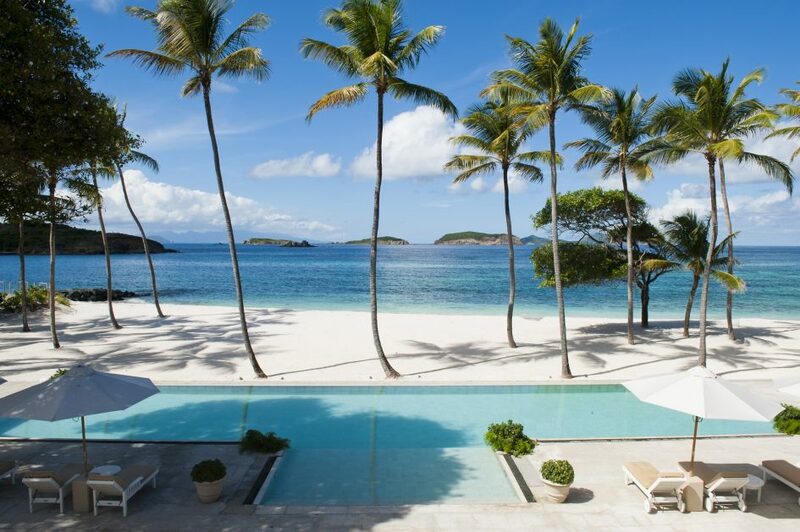 The villa has fantastic views across the crystal clear blue waters of the L’Ansecoy Bay in Mustique. It is perfectly placed on six beachfront acres and has fantastic verandas and a gorgeous swimming pool all facing out across the bay to make for those much needed relaxing moments. The luxurious villa with a swimming pool can welcome up to 16 guests and boasts of of elegant living spaces, a wonderful team of staff to welcome you into your summer villa as well as great facilities of a being a villa with a tennis court, home cinema and pool. However, in my view it is the stunning situation of the villa that makes this property truly unique. Villa Red Land is one of our ultimate luxury villa collection and is situated in Divulje on the Dalmatian coast in Croatia. Divulje is found between the two popular Dalmation destinations of Split and Trogir. being positioned directly on the beach,the villa is perfect for a Croatian retreat. You can moor the boat and get daily trips to the islands of Hvar, Brac and Vis. There is also a fantastic garden and swimming pool looking completely out across the coast. The villa sleeps up to 8 guests and provides a fantastic choice for anyone looking to explore the popular neighbouring Croatian cities whilst still having a secluded beach oasis to return to afterwards. So there we are, some fantastic villas with amazing beach front locations, what more could you want? These are just some of the great luxury beach front villas that we offer. If any of these have caught your interest or you would like us to explore more options for you then you can give us a call on +44 1202 203 656 or send us an email. Alternatively check out our Facebook page for regular updates.